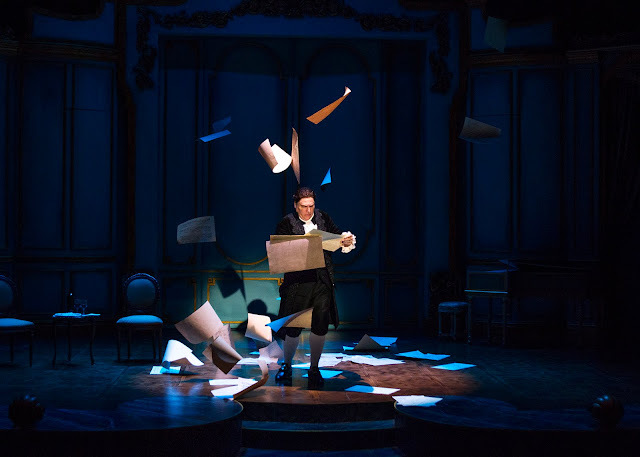 Marco Barricelli as Salieri in South Coast Repertory's 2016 production of Amadeus by Peter Shaffer. Photo by Debora Robinson/SCR. Peter Shaffer's Amadeus opens in 1870 with the stark raving mad Antonio Salieri, once the most revered composer in Vienna. He claims that he killed Mozart, his one time rival, who died 30 years earlier. The play takes the audience on a journey (back in time) to unravel the delusions or possible confession of an artist now past his prime. For tickets, check out scr.org. Louis Lotorto, Marco Barricelli and Christian Barillas in South Coast Repertory's 2016 production of Amadeus by Peter Shaffer. Photo by Debora Robinson/SCR.